Simon is a Polish immigrant who came to England around twelve years ago. His journey has been a difficult and varied one. Since his arrival on our shores he has travelled around the country working in various temporary jobs in order to get along and support himself. He came to Scarborough a few months ago and decided to look for work. Work is hard to find out of the summer season and unfortunately Simon fell on hard times and became street homeless. In February he was referred into the RACS team Scarborough and assessed. Simon signed up for support with Foundation and was accommodated in a Foundation property. Simon struggles with mental health issues and has done for many years. Yet despite being in a strange country with language, cultural and other barriers, finding himself with a safe place to live has helped him to feel happy and content. 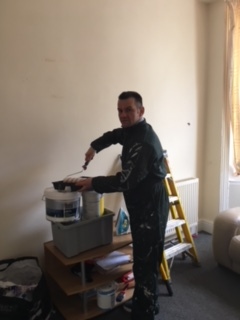 Simon asked me if he would be able to paint his flat. 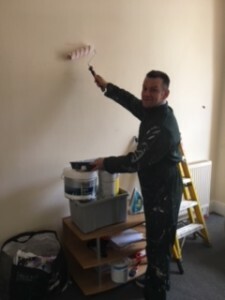 With backing from my manager, I set about in obtaining paint, brushes and other equipment in order for Simon to decorate and make his accommodation homely to him. Simon has accessed Mercury House services to gain help for other issues and is much improved and very happy. Simon told me that only a few weeks ago he was sleeping outside and using Winter Watch now he has a flat and his basic needs are being met. He says all he needs to do now is find a job. Simon is grateful to Foundation for his support.